Friday, November 30th, 2pm-4:30pm, at the Andersen Library. 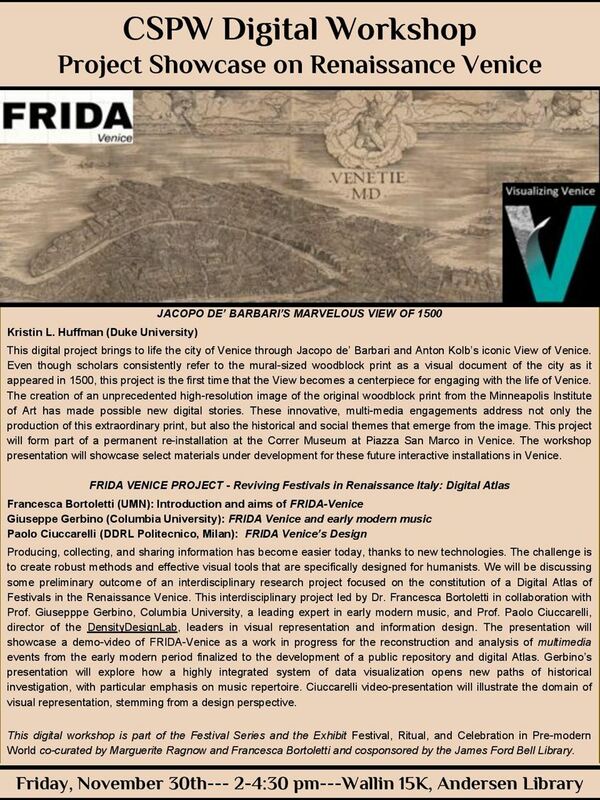 This workshop aims to showcase two digital projects both focused on Renaissance Venice. The first project led and presented by Dr Kristin L. Huffman (Duke University), focuses on the Jacopo de’ Barbari’s Marvelous View of Venice in 1500. The second, Festival in Renaissance Italy Digital Atlas (FRIDAVenice), led by Dr. Francesca Bortoletti, University of Minnesota, will be presented by a team of collaborators, Dr Giuseppe Gerbino (Columbia University), and Dr. Paolo Ciuccarelli (Density Design Lab, Politecnico, Milan).